Two students have drowned while taking selfies in a swelling river in a remote part of the Indian state of Uttar Pradesh. Indian media reported that the accident happened while local students were picnicking on the banks of the Kosi river in Rampur district. A police official said a group of boys went into the river and two ventured too far into deep water. 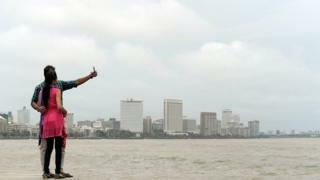 Several people have died in India while taking selfies over the last year. "A group of students were bathing in the swollen river," Police inspector Kushalveer Singh told the BBC. "Two decided to go deeper into the river to get a better selfie, but they lost their balance and drowned." The rescuers took more than an hour to retrieve the bodies of the victims, he added. Twelve other teenagers who had been bathing were reported safe. Eyewitnesses speaking to local media said the boys appeared to have been caught unaware by a surge of water that could have been released from a nearby dam. Earlier this year police in Mumbai declared 15 locations in the cities as places where taking selfies "can be dangerous". The move followed the death of an 18-year-old girl who drowned in the sea while taking a picture. Last year, authorities also imposed a "no selfie zone" at a Hindu festival due to fears they could cause stampedes.